The E351 Series is a four-door medium-distance-type electric multiple unit developed by JR East to replace the regular-steel 403 and 415 Series trains on the Joban and Mito Lines. 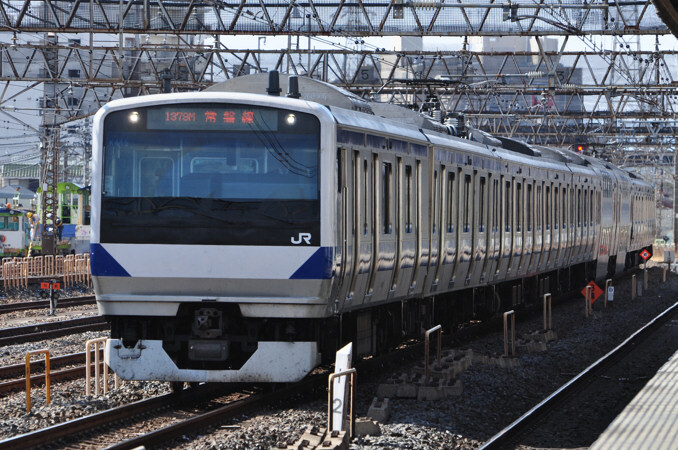 With the appearance of new rivals such as the Tsukuba Express Line, JR East felt the necessity to replace its aging fleet of 403 and 415 Series trains with a newer design based on the E231 Series. Similar in design and appearance, the E531 Series can be thought of as an AC/DC version of the E231 Series suburban-type train. It has a higher top speed than previous trains and also has deluxe double-decker green cars with more comfortable seating. Most trains are operated as 15 car formations comprised of a five car formation attached a 10 car one. The E531 Series uses variable frequency drive with IGBT elements. Like most contemporary designs, it also uses bolster-less bogies. Six to seven of the cars have crosswise box-type seating and two are deluxe green cars.